Researchers from the University of Notre Dame, the University of Iowa and Cornell University have been awarded collaborative grants totaling $1.1 million from the National Science Foundation to answer a fundamental question: As a new species evolves, how, and to what extent, do other species that depend on it evolve as well? In this case, the targets of study are a fruit fly — specifically the apple maggot fly — and some of its deadliest predators, parasitic wasps. “These may not sound like big players in the animal kingdom,” says Scott Egan, a research assistant professor with Notre Dame’s Advanced Diagnostics and Therapeutics initiative and a co-principal investigator on the study, “but there are more species of plant-eating insects and the predators that attack them than any other group of life forms on Earth. For millions of years, the larvae of the North American fruit fly Rhagoletis pomonella were content to grow in and feed on haws, the fruit of the native hawthorn tree. Then, in the early 19th century, farmers from Europe began the widespread planting of apple trees. Some flies began to lay their eggs in the new fruit, and others stuck with the old. This started a process in which, over the last 150 to 200 years, the fruit flies have been gradually evolving from a single variety into two distinct and separate species. Biologists call this process speciation. 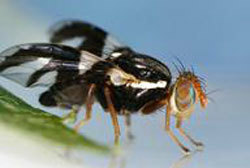 Of particular interest to Jeffrey Feder, professor in the Department of Biological Sciences and Notre Dame’s principal investigator, are how the three species of wasps that prey on the apple maggot fly, and who use the bodies of the flies they kill as hosts for their own young, will respond. “We want to determine whether the evolution of a new species provides an opportunity for other organisms to take advantage of this and speciate in kind,” he says. This knowledge may also have practical benefits for U.S. agriculture. Rhagoletis flies are serious pests of not only apples, but cherries, blueberries and several other economic crops, and they cost growers tens of millions of dollars each year in monitoring, quarantining and control activities. For example, in the state of Washington, which leads in the U.S. in apple production, if apple maggots are captured within a half-mile of an orchard on two consecutive inspections, the entire orchard must be destroyed. “The question of whether the fly’s predators have formed new species can affect integrated pest management strategies,” explains Egan. “If different wasp species attack each fly, then biocontrol efforts would need to rear and release each of the wasps separately to control each of the fly pests. Using the wasps to help limit the spread of apple maggot flies could have large-scale economic benefit. Studies show that slowing their spread by just 10 percent per year could save the apple industry $8 million annually.